In Finland, more than 2 million meals are daily eaten outside home. Thus the nutritional quality of those meals is of great importance to public health. 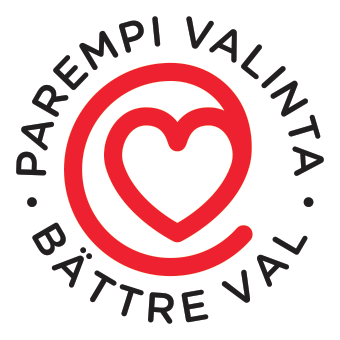 Restaurants and caterers which want to join the system, apply for the right to use the system from Finnish Heart Association. In order to get the right to use Heart Symbol, a restaurant must fulfill all criteria in at least one meal that includes main course and side dishes. The criteria is based on Finnish national nutritional recommendations (by National Nutrition Counsil). a) The grain used must have at least 6% dietary fibre. b) There has to be at least 150g vegetables/portion in salads. All other vegetables except for potato is taken into account. g and j) to ensure that meal contains enough unsaturated fat. In addition to criteria, restaurant must give customer information: healthier main dishes and meal components are marked with symbol on buffet.